We at HMT dedicate ourselves to giving you the best tours possible. More than 20 years in business has given us the time and opportunity to fine-tune our routes and logistics as well as innovate new tours which maintain the balance between adventure, culture and safety that have won us renown. Limited group sizes give you both the optimum experience on and off the bike as well as make for a safer tour. We design our days and itineraries to keep you interested, safe and alert: from tea breaks which minimize fatigue and distraction to rest days just when you need them; even our ascents to elevation are staged to optimize acclimatization and enjoyment. We love what we do and where we do it, and it infuses our entire endeavor. Come join us for the ride of a lifetime! 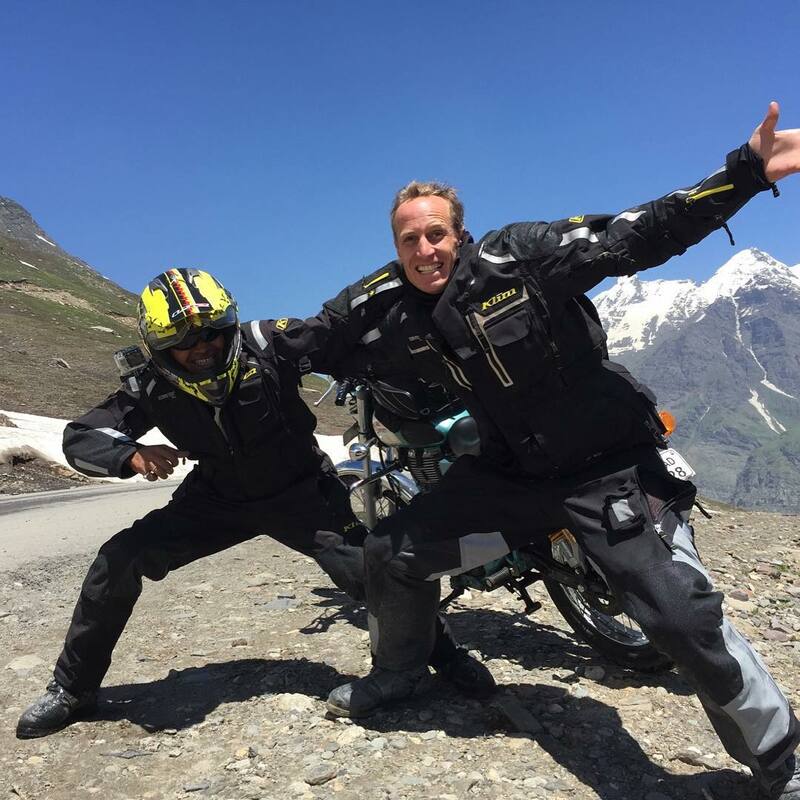 We are a small business - your guides are the folks who own and run Himalayan Moto Tours. As such, we're not only invested in maintaining and improving the business, but we're even more invested in making sure your experience is terrific. Alam and Eric have more than 40 years combined experience running tours and have led literally hundreds of them. We know and love the lands we ride, and we love sharing that passion and knowledge with you. Our fleet consist of newer model 500cc Royal Enfield Classics and Standards in India and Bhutan and the new Royal Enfield Himalayans in Nepal and Tibet. We keep our fleet in tip-top shape and also make several modifications to the standard models to improve handling, comfort and safety. Our mechanics are paramount, we go through the bikes thoroughly before, during and after each tour to make sure your bike is in peak condition. With more than 20 years in business, we have crafted our tours to give you the ultimate motorcycle experience. We choose regions of both geographical and cultural interest, and we balance our itineraries to provide you with enough riding time, safety breaks and free days to keep you alert and rejuvenated, and routes that combine challenge and reward. We have refined our existing tours as well as pioneered new ones to offer the same balance of adventure and cultural exploration that is the heart of our company. We hand pick our staff to give you the perfect combination of knowledge, competence and heart. Whether it's repairing a flat tire along the way, distributing bottled water or chocolates during the ride or checking over and making adjustments to the bikes in the mornings and evenings, our staff will always greet you with a smile. We're genuinely here to make your trip better, and it shows. We go out of our way to find great places to stay. "Best Available Accommodation" is our motto, and this means a combination of luxury, character and convenience. When in cities and near other points of interest, we strive to put you close enough to the action to make exploration easy while also providing the right amount of isolation so that you can get the rest you need. We favor the hotel or guesthouse that has history, character and ambiance over the shiny, soulless hotels that are are so commonly the norm. We are one of the oldest motorcycle touring companies in operation in Asia today. Our reputation for high customer service and safety are known throughout the world and our high return rate speaks to an operation that knows what it's doing. We are responsible for pioneering itineraries and permissions that have become standard routes throughout Asia today, including Kardung La and the Nubra Valley in Ladakh, Lhasa and Everest Base Camp in Tibet, and eastern Bhutan and Assam.